The presence of an accused during his trial is a fair trial right guaranteed under the Constitution. In 2008, the Code of Criminal Procedure 1973 (CrPC) was amended to introduce electronic video-linkage as an alternative method for production of an accused in court. 9th November 2017 marks the 23rd Legal Services Day. As is customary, we bring to you an update on the latest developments in legal aid in India. In the last one year NALSA has brought a slew of changes, which we believe can go a long way in improving access to legal aid in the country. The training was aimed at training the Para-Legal Volunteers appointed by the DLSA, Howrah throughout the district to man the front office of the DLSA & SDLSC, Police Stations, Correctional Homes and Block Level Offices. In the past, a few had shared their inability to understand their roles and responsibilities in carrying out their function. The last parliament session - 'Monsoon Session' was held from 17th July to 11th August 2017. During the session, the Members of Parliament (MPs) posed questions to various ministries to seek information on the working of the government and therefore bring more accountability. 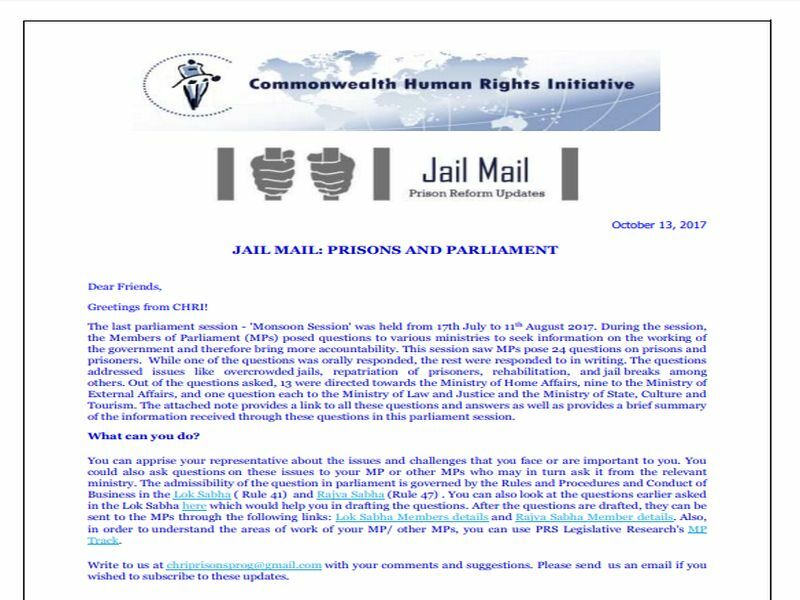 This session saw MPs pose 24 questions on prisons and prisoners. CHRI made a presentation on 'Proactive Information Disclosure - Parameters, Performance and Pushing the Envelope' at the workshop on the Right to Information for Stakeholders in South and South East Asia. The workshop was organised in Bangkok on October 3-4, 2017. 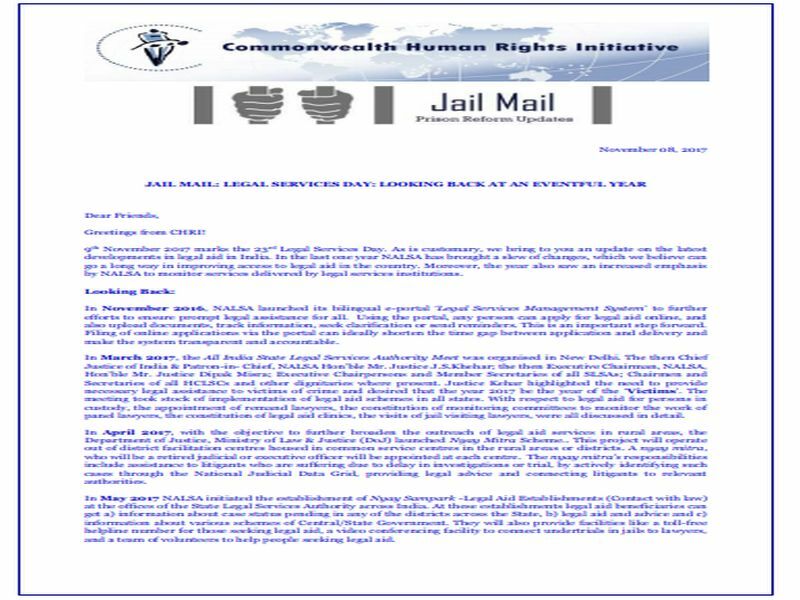 Prison Legal Aid Clinics in West Bengal: Bringing Justice Closer? 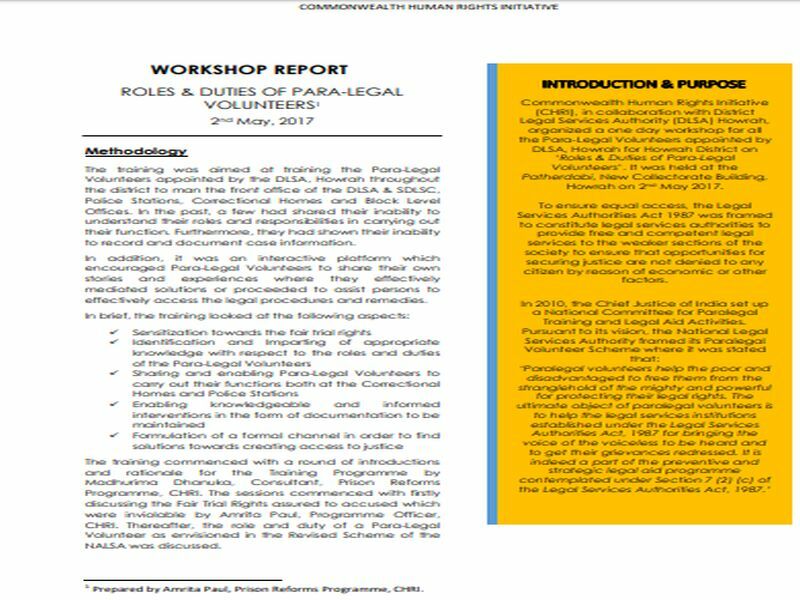 NALSA Standard Operating Procedures for Representation of Persons in Custody 2016 mandates setup of Prison Legal Aid Clinics in prisons across India. 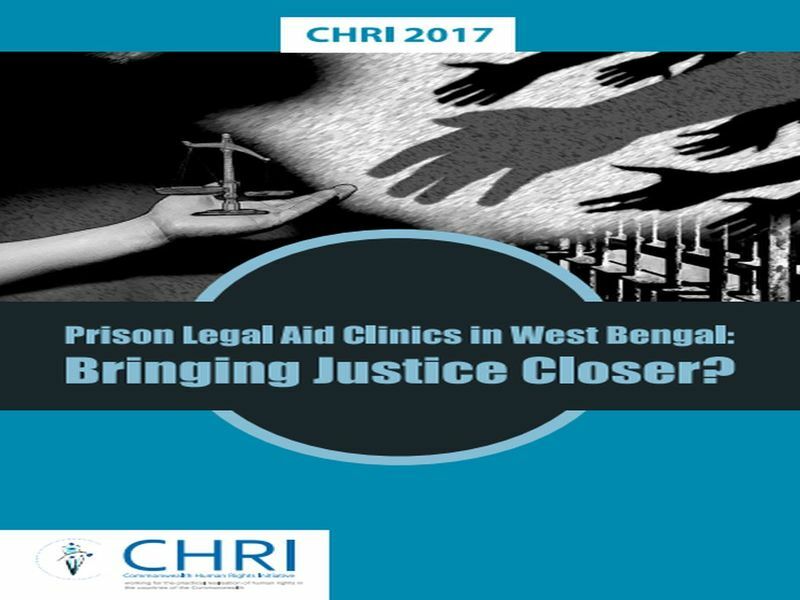 This study documents the functioning of the prison legal aid clinics in a few correctional homes in West Bengal. 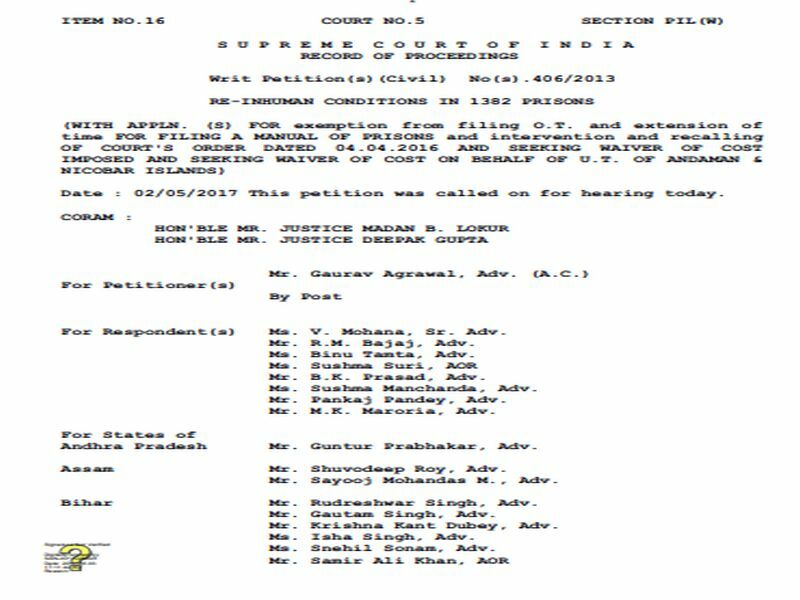 Order of the Supreme Court on directing set up of committee to develop training manual for prison staffs vide case order dated 2nd May 2017. CHRI and the Institute of Correctional Administration organised a roundtable on Repatriation of Indian Prisoners in Foreign Prisons on 13 July in Delhi. 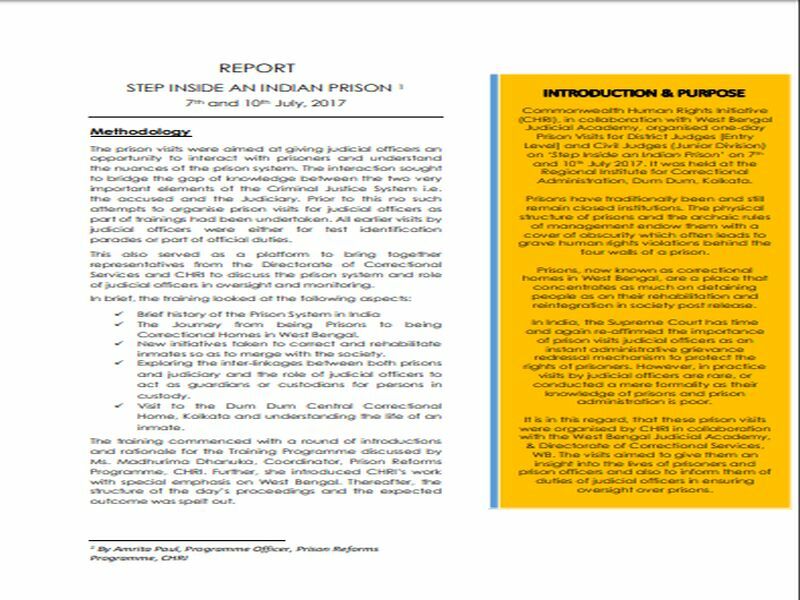 CHRI presented its preliminary findings from its upcoming report on Barriers to repatriation of sentenced Indian prisoners abroad. CHRI in collaboration with West Bengal Judicial Academy & the Regional Institute of Correctional Administration, Kolkata, organised Prison Visits ‘Step Inside an Indian Prison’ for District Judges [Entry Level] and Civil Judges (Junior Division) on 7th and 10th July 2017 to Dum Dum Central Correctional Home, Kolkata. 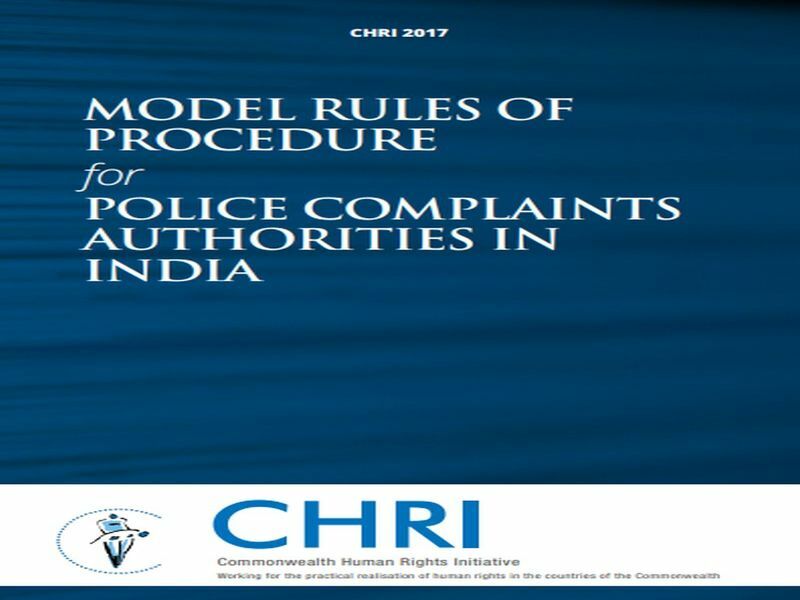 CHRI has drafted Model Rules of Procedure to guide the inquiry process and functioning of the Police Complaints Authorities in India. The Model Rules, drafted following consultations with civil society, lawyers as well as few functional Authorities, also provide brief commentary to explain the rationale and purpose behind key provisions. These were first published in 2012 and updated in 2017.